It’s time for New Year’s resolutions! How about this one? 1. Redefine your job in your head. Our job is to change what people do, not just what they know. We need to design experiences, not information. Design practice, not a quiz. If you’re a freelancer, take a critical look at your marketing. Is your overall message “I create courses for you,” or is it “I solve your performance problems?” Attracting the right clients makes being a hero a lot easier. If you’re an employee, does your organization treat you as a developer, or as a consultant? If you’re in the “developer” slot, is there a more consultative role you can move into? If no one is doing any analysis of performance problems(! ), can you sneak some analysis into your next project to show how it improves results? 3. Challenge yourself. It’s easy to deliver an order. It’s harder to politely resist a band-aid solution and ask the kinds of questions that could really bring results. Like any superhero, sometimes you’ll have to do uncomfortable things, like change clothes in a phone booth, but you’re saving the world, so it’s worth it. 4. Challenge your audience. You’re supposed to make training “engaging.” But what’s engaging? A presentation followed by “Can you remember what you were told 3 minutes ago?” Or an intriguing problem like the ones you have to solve on the job, but that has optional help and shows you better ways to find solutions? For more on this, you might check out my scenario design course, and see the posts in the scenarios section of this blog. 5. Celebrate your wins, even the little ones. Did you persuade a client to let you analyze the problem? Did a stakeholder agree to start with a realistic challenge instead of an information dump? Did you talk a client out of adding redundant narration for debunked learning styles? Celebrate! We’re trying to change a deeply embedded belief that claims our job is to stuff knowledge into brains. Even small wins are steps in the right direction. Celebrate them! For more motivation, you might like my decidedly non-serious L&D Manifesto. Get the most from action mapping and design challenging activities in my live, online course. You’ll build skills that will help you create challenging, realistic mini-scenarios and branching scenarios, and you’ll immediately apply what you’re learning to a real project on your job. Sessions are scheduled for many time zones, including Australia and New Zealand. The course tends to sell out, so you might check it out now so you don’t miss out. Hah, just the moment I read the post and thought “hm, it’d hard to do this while being alone, against the current / intertia of how eLearning is thought about now”, when I saw the link to the manifesto. It’s also a good, seminal thinking – in terms of “saving the world” as a framework for everyday activity context! So many inspiring ideas and perspectives to help get geared up for 2017. I love the analogy of the superhero. They say something to the tune of…you should dress for the job you want if you aren’t happy with the one you have. I wonder if I can were my Wonder Woman cape to work :-). Maybe I’ll just hang it up in my cube for good measure. As always, thank you Cathy for a great year of insight, support, and resources. 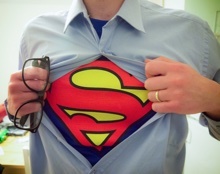 I love that we have an opportunity to become learning and development heroes! That made me smile. This is so true. We need measurable objectives in order to prove the value of our learning and development initiatives. I agree, we need to challenge ourselves, our audiences, and our stakeholders. Celebrating wins is fantastic! Thanks for sharing.